10/9/2014Share this story on Facebook! 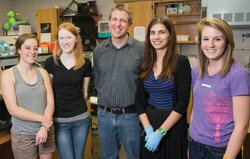 Ian Woods has a number of students working for him in his lab, many of whom have received funding. Haley Coleman ’14 presented her research at the National Conference for Undergraduate Research at the University of Kentucky in Lexington this past spring. She received funding from the School of Humanities and Sciences dean’s office. Sadie Schlabach ’15 received a Dana internship to conduct research in the lab. Rachel Noyes ’13 received funding from the H&S Educational Grant Initiative and the Ithaca College Annual Fund to help support the research she was working on in Woods’s lab. Some students grab books off library shelves to research their assignments, but Elitsa Stoyanova ’14 navigates her way through an aquatic library of fish tanks—and her “assignment” is studying the relationship between genetics and anxiety. Her work in the lab may eventually lead to better treatments for anxiety disorders, which affect some 40 million Americans. In conducting her research, Stoyanova works with zebrafish, minnow-type fish that average one to two inches in length and are named for the parallel black stripes that run the length of their bodies. Since zebrafish produce a large number of offspring, mature quickly, and develop transparently, Stoyanova and other IC students are more easily able to monitor the development and behavior of hundreds of fish at once with the help of cameras. Ian Woods, assistant professor of biology, started the zebrafish lab in 2011 when he arrived at Ithaca College. Woods explains that zebrafish are genetically similar to humans and can show anxiety-like behaviors. 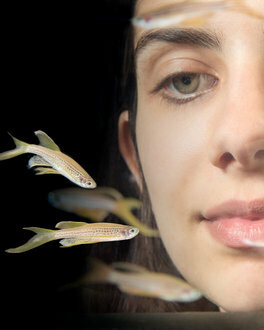 The experiments on these little fish therefore help him investigate connections between genetics and anxiety. To test these connections, the zebrafish are introduced to stimuli such as wasabi (a mustard-like irritant), lighting changes, and slight variations in temperature. Generally fish swim more toward the center of their enclosure, but they may swim along the edges of the tank if they become agitated and anxious, depending on the stimuli they are exposed to. In order to maintain the quality of the experiments being done, the fish need attention 365 days a year. Students like Stoyanova are essential to this work because they help care for over 3,000 adult fish in 250 different tanks in addition to performing their own laboratory research. Stoyanova’s work in maintaining and observing the fish is critical not only for scientific advancement but also for her personal growth as a scientist. Stoyanova has always been passionate about science. In her youth, she excelled in national science exams in Bulgaria and continued to pursue those interests when she moved to Red Hook, New York. During her college search, she considered her experiences living in both Bulgaria and the United States. Hoping to find a place that combined her values of community with her drive for independence, Stoyanova found herself at Ithaca College two years after moving to the United States. “I had no idea what to look for in a college; it was kind of like shooting the dart and hitting the bullseye,” she said. Her accomplishments in college started as a freshman when she was given the opportunity to join a research lab, something quite rare for freshmen at other universities. In the same year, she presented her own research. Then, as a junior, she presented her work at the American National Chemical Association. She also interned with the University of Pennsylvania’s Children’s Hospital in Philadelphia. Catherine Malele, assistant professor of chemistry, used her connections to help Stoyanova secure her summer internship. Stoyanova credits her success to the strength of the degree program at IC and the help and guidance she received from professors. Confident from the experiences she gained at Ithaca, Stoyanova is ready for another challenge. “I have already done three-and-a-half years of research,” she said. “I know what I want.” And as a result, she applied to the top 15 graduate schools for scientific research. This fall, Stoyanova will be attending Rockefeller University in New York City, which has one of the world’s strongest programs in biomedical sciences, chemistry, and biophysics. The university lays claim to 24 Nobel Prize winners and has strong relationships with the Memorial Sloan Kettering Cancer Center and Weill Cornell Medical College. The program Stoyanova entered includes close mentoring by faculty, rigorous training, and full financial support, including a stipend and research budget. At Rockefeller she hopes to continue her studies on developmental research but be able to have more leadership in the lab. “I want to have a project that’s my own and take it to the next level,” she said. “That is how you learn to be a scientist.” With the experiences she gained at Ithaca, Stoyanova feels confident and prepared to take on her future.